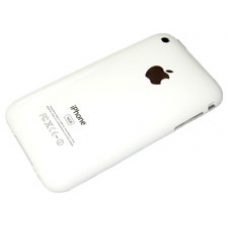 This is an iPhone 3GS 32GB White plastic rear case with the front chrome bezel attached. If you have damaged your rear case and bezel in any way, or just feel like a making your 3GS iPhone look like new or giving your 3GS White iPhone a makeover, this is the ideal part for you! * Includes Camera Lens Cover. * Includes Silver Earphone Jack Ring.